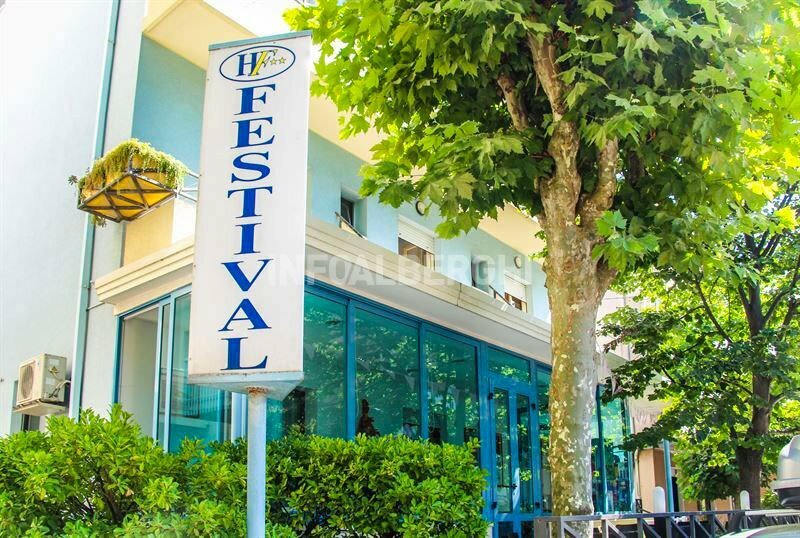 Near the seafront of Viserbella di Rimini, Hotel Festival is a 2-star family-run hotel. It offers enclosed parking, WI-FI connection, a garden and a playroom for children. Admits small animals. The hotel is located in Viserbella di Rimini, in a quiet and peaceful area just a few steps from the beach. The theme park of Italia in Miniatura can be reached in less than 10 minutes by car, as well as the Fiera di Rimini. The area is well served by public transport: the Viserba train station is a 5-minute walk away while the bus stop is only 3 minutes away. Each room is equipped with digital terrestrial TV, ceiling ventilation, WI-FI connection, safe, telephone, private bathroom with hairdryer. Some rooms have balconies, air conditioning for a fee. FAMILIES: cots and multi-bed solutions are available, ideal for groups and families. Garden, free bicycles, open-air porch, hall with bar area, TV room and newspapers available, indoor games room. Available beach towels and a welcome drink. A special feature: the hotel also accepts payment with Satispay. PARKING: fenced and free, located 500 meters from the hotel. AIR CONDITIONING: throughout the entire hotel, for a fee in the rooms. BREAKFAST: sweet and savory buffet with cakes, pastries, jams and homemade bread, biscuits, yogurt, cereals, fruit juices, meats and cheeses. LUNCH AND DINNER: 2 menus with choice of meat and fish dishes and local raw materials, including stone-ground flours, cold-pressed olive oil and many vegetables produced directly in the family garden. Meals are followed by fresh fruit, pastries and ice cream. Water included. VARIATIONS: vegetarian menu available and, on request, dishes for those suffering from food intolerances. At meals: high chairs at the table, baby food and menus for children. The hotel has an agreement with the Bagno n. 40 with beach beach umbrella and sunbeds, a small playground for children, entertainment service, a bocce court and pedal boat rental. Weekly offers include a mineral water pension with meals, beach service, and beach towels. STAY TAX: Not included. € 1 per day per person, for a maximum of 7 days. Excluding children up to 14 years. - Weekly offers are scheduled for today. - The last day of booking indicated is intended as day of departure. - As per the rules the rooms are delivered before 2 pm from the date of arrival. - Meals not consumed are not refundable, a request to be replaced with travel baskets. 2 Days in bed and breakfast € 76.00 per person. We offer Breakfast with a rich buffet, WI FI throughout the hotel, fenced parking, 1 entry for 2 days at the Parco Italia in Miniatura. The hotel festival is waiting for you at the Rimini wellness center and has a special offer for you. We are a few km from the fair and a few steps from the sea. Discounts also for single parents.